The Rotarian Action Group Against Slavery (RAGAS) looks to provide information about, and promote ways for you to engage and support anti-slavery and human trafficking projects, programmes and campaigns. We are Rotarians collaborating with non-profit organizations assisting victims, elected officials and law enforcement agencies. Our focus is raising awareness, providing advocacy & assisting victims. On July 20, 2019 proud Playa Venice Sunrise Rotarian Rob DeCou will swim from Port Angeles, WA to Ogden Point in Victoria, Canada (18.3 miles) to raise awareness for this cause. 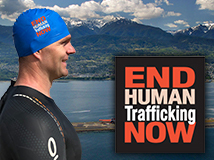 Click here to learn how you can support Rob's swim and click here to learn more about Rotarians Fighting Human Trafficking. Rotary set out in 1985 to eradicate polio throughout the world. We are 99% of the way there having only a few reported cases recently in Afghanistan and Africa. We must go 3 years with no new reported cases for the world to be declared “polio free”. Playa Venice Sunrise Rotary Club is extremely proud to be an annual contributor to this program having raised almost $5,000 recently due to some extra efforts by some of the club members! Playa Venice Sunrise Rotary is a partner to this very worthwhile organization “BABB” whose mission is to promote health and wellness with a “whole lot of heart” and deliver healthcare and education to the people and children of Benin, West Africa. Sarah Chapman, a traveling nurse and Honorary Member of the club, founded BABB and travels to Benin every year to bring much needed supplies and oversee funding for educational programs, safe housing and sustainable projects. Sarah visits the club on an annual basis to provide an update to the members of the programs and projects in Benin. Several years ago some members of the Playa Venice Sunrise Rotary Club visited a region in Mexico near Lake Chapala/Ajijic to meet with a partnering Rotary Club and assess the needs of the area. It was discovered that the Chapala Fire Department did not have the uniforms or proper equipment to fight fires, there was no running ambulance for the area and the firefighters needed training. The Playa Venice Sunrise Club formed a partnership with “Los Bomberos” of the Los Angeles Fire Department to bring much needed equipment to Mexico as well as an ambulance which has been secured and delivered. The Rotary Club continues to fund several training trips to Los Angeles for the Mexican firefighters to train at the Los Angeles Fire Academy.